Hi friends! 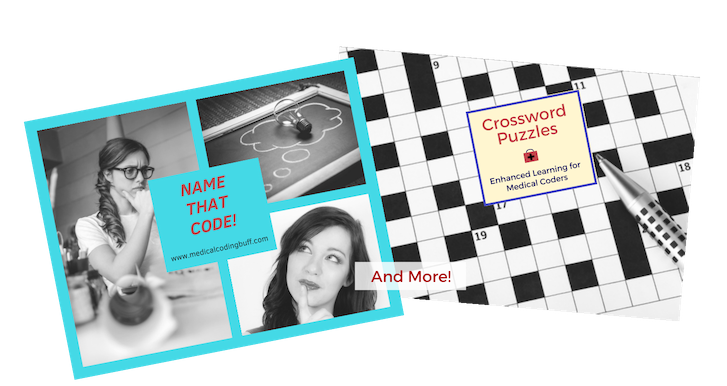 I keep my coding exercises, crossword puzzles, and other valuable freebies on my FREE Resources page. It is open to everyone and includes LOTS of helpful information to help you become a successful medical coder. Because I truly love to share, you can count on me to continually add more FREE coding exercises, crossword puzzles, and other great tools to make your coding education easier and hopefully more enjoyable. This Resources page is open to everyone for free. All you need is the password to get in, which you can get by filling out the form below. SUBSCRIBE TO MY EMAILS AND GET FREE ACCESS TO MY RESOURCES PAGE! Get FREE access to Medical Coding Crossword Puzzles, Coding Exercises with answers and rationales, and MORE! I will continue to add more valuable tips and resources on a regular basis and will send you periodic updates. You have successfully joined our subscriber list! Now check your email to confirm your subscription and get your FREE access to my Resources page. The password is success . If you already have your password, enter the Resources page here. Password Tip: I recommend you copy and paste the password in to avoid any mistakes. If you forget your password, please email at debbie@medicalcodingbuff.com. Not working? If you enter the password and the same page refreshes without any contents, that means you put in the wrong password. Double-check your email, copy the password, and paste it into the link above. Still not working? I promise the password works. I haven’t changed it, and many people use it regularly to enter my library. Please try the copy and paste method again and make sure the URL you are going to has https at the beginning of it, which means it’s a secure page. If you still have problems, you may need to try a different web browser.